This small hoverfly was seen at the top of McIntyres Field, east of Lancing Clump. Platycheirus ? The only other hoverfly seen was a 50% larger Marmalade Fly Episyrphus balteatus. Frequent Drone Flies, Eristalis, Marmalade Flies Episyrphus balteatus, and at least one Syrphus hoverfly were recorded on the Slonk Hill Cutting southern path on passage. This very small species was recorded in Buckingham Park, Shoreham. The photograph is simply not good enough for ID. The frequent hoverflies in Shoreham town and gardens were Drone Flies, Eristalis tenax, Marmalade Flies Episyrphus balteatus, and there was at least one Myathropa florea seen and photographed. The small hoverfly on the left is thought to be a species of Platycheirus of which there were several in a Shoreham garden. The photograph shows the abdomen patterns enhanced to show as clearly as possible for identification purposes. I did not visit the Waterworks Road but passage through the Butterfly Copse frequent hoverflies (mostly Eristalis tenax but also Syrphus). At least two pairs of Drone Flies, Eristalis tenax, were seen courting in in a Shoreham garden and they buzzed off when disturbed. A handful of Drone Flies, Eristalis tenax, were seen in all shady places with vegetation and they were probably widespread and prevalent. A Syrphus hoverfly was recorded in the Butterfly Copse (next to the Waterworks Road). At least one Drone Fly, Eristalis tenax, on Slonk Hill Cutting south, dozens of Marmalade Flies Episyrphus balteatus, and in a Shoreham garden a Helophilus pendulus buzzed around the pond noisily. This small hoverfly was photographed on the Slonk Hill Cutting Hawthorn on the southern side. This is guessed at Melanostoma scalare but there is not nearly enough detail in the photograph to be sure. It is a female and the genus is probably correct. Hoverflies were less than expected at the lower end of the Pixie Path (route from the Waterworks Road to Mill Hill) by the Butterfly Copse. A handful of Drone Flies, Eristalis, flew around the Ivy. The hoverfly Helophilus pendulus buzzed (I did not actually hear it) around the brambles in the south-west corner of the Mill Hill Cutting by the Pixie Path. A Volucella zonaria hoverfly was photographed on Buddleia in my south Lancing garden, (TQ 186 044). Passage by the Elm Corridor on New Monks Farm revealed two Volucella zonaria hoverflies and a further one at the Steyning Road entrance to the Maple Field Spinney by the Waterworks Road. A handful of this small species of hoverfly flitted around in Ray Hamblett's south Lancing garden. This hoverfly from the top of The Drive, Shoreham looks like a Syrphus. This species is frequently seen. This ID is not confirmed. This hoverfly Volucella inanis was discovered in McIntyres Field, near Lancing Ring. The difference was noticed by Andy Horton from the more usual Volucella zonaria. This is the first confirmed record of this hoverfly on these Nature Notes pages. 1 August 2005. This latter hoverfly was seen on the same umbellifer as Volucella zonaria. Another Volucella zonaria next to the Waterworks Road and this large hoverfly does not seem unusual any more, and along with the ubiquitous and very common (500+ in a day) Marmalade Fly Episyrphus balteatus, frequent Scaeva pyrastri, frequent Myathropa florea and occasional Erastalis tenax (the Drone Fly), means that hoverflies are numerous and most of them I pass unrecognised. The tall fragrant Fennel plant in my Lancing front garden is now a magnet to the neighbourhood hoverflies. There are around twenty hoverflies flitting around the flat umbelliforous flowers. Most of them are the ubiquitous Marmalade Fly Episyrphus balteatus, others including Scaeva are apparently taking the nectar from the flowers. Another Volucella zonaria was seen in the scrub of the north-west of Mill Hill. Myathropa florea was widespread and frequent in the shadier places on the outskirts of Shoreham. In the damp shade of the Elm Corridor on New Monks Farm, flying insects included at least five species of hoverflies, including two of the spectacular Volucella zonaria, the black and yellow Chrysotoxum bicinctum, the common Episyrphus balteatus, and other familiar species like Myathropa florea and the small Sphaerophoria scripta. A specimen of Volucella inanis was confirmed by a photograph (but not discovered until 17 August 2005). This hoverfly is appreciably smaller than Volucella zonaria. The hoverfly Volucella inanis visited my south Lancing garden. The first and third images are from the Slonk Hill south bank, and the middle image is from the upper slopes of Mill Hill, just north of the Reservoir. The first hoverfly is Scaeva pyrastri and the others and mating pair are Sphaerophoria scripta. Species of hoverfly were collectively common in the shadier bits of the Slonk Hill south spinney, about 80 Episyrphus balteatus and at least a dozen Myathropa florea and more than half a dozen of at least one other species. A sighting of the large and spectacular hoverfly Volucella zonaria over New Monks Farm, Lancing, was the first of the year. Myathropa florea were frequent (20+) on the shadier bits of the Slonk Hill south spinney and present everywhere shady, but not as numerous as the common (100+) Episyrphus balteatus. This looks to me more like a mimic of a bumblebee than a bee because of the short antennae and hoverfly-like face. It was only the size of a Carder Bee. The hoverfly was not immediately identified. It looks like a Volucella pellucens. The variation in the colour, compared to the above specimen, could be a temperature difference in larval status. Hoverflies included the species Helophilus pendulus (pic) on and around the Stinging Nettles on the Waterworks Road and the bumblebee mimic Volucella bombylans var. plumata was instantly spotted at the western entrance to the Field Maple spinney. One yellow and black hoverfly (it behaved like a hoverfly) in the Butterfly Copse next to the Waterworks Road was unfamiliar but it flew away before it could be photographed. Another hoverfly was Volucella inflata which I have only just been able to recognise. A distinctive hoverfly, the bumblebee mimic Volucella bombylans var. plumata was instantly spotted at the western entrance to the Field Maple spinney (hereafter called the Maple Spinney) footpath between the Waterworks Road and the Steyning Road. This hoverfly seems to be frequently seen (over 12 records, probably more like 50) in June. Hoverflies on the Slonk Hill southern bank included one Volucella bombylans var. plumata. This species is a bumblebee mimic. My garden in Corbyn Crescent hosted a Myathropa florea. This hoverfly was not recognised immediately. It is Volucella inflata. It was discovered at the top of McIntyre's Field, where there are rotting Beech logs, near Lancing Clump. This species is the first one recorded locally. Two of the usual hoverflies were on the A27 road bank at the top of The Drive in Shoreham: Myathropa florea distinguished by its appearance and behaviour, and a familiar one that has escaped precise identification. The hoverfly Merodon equestris settled in a Shoreham garden. This hoverfly Helophilus pendulus buzzes like a blow-fly and could be mistaken for a wasp so I doubt it is high on the general popularity stakes. However, it hovers like it should and returns to the same leaf repeatedly, so it is quite obliging for the photographer under the strong sun, as it hovered around my garden pond in Corbyn Crescent, Shoreham. At the top of The Drive, Shoreham, Marmalade Flies, Episyrphus balteatus, and other hoverflies were noticed in numbers in excess of twenty on one bush. A handful of the pretty hoverfly Leucozona lucorum were seen in the shady area at the top of The Drive, Shoreham. This is another small garden species of hoverfly that visited the only Bulbous Buttercup in my front garden in a crowded industrial area of Shoreham. I think this is the prevalent Sphaerophoria species (S. scripta) but I have not double-checked for close species (which is an unlikely differentiation from a photograph). A small species that is frequent in a Shoreham garden. It would not settle and the poor quality photograph was taken of the hoverfly in flight. This one looks like Epistrophe eligans. At the Mash Barn Lane end of New Monks Farm, Lancing, the hoverfly Volucella bombylans var. plumata was seen. The Hoverfly, Epistrophe eligans, was recorded from New Monks Farm (Lancing) but not identified correctly until much later. The common Alexanders on the southern part of Mill Hill attracted hoverflies. The photograph is the hoverfly Leucozona lucorum. There has been an explosion of this species in Holland and Belgium this year. This pretty little hoverfly is widespread and common in England. Myathropa florea and Erastalis tenax (the Drone Fly) were also hovering around the umbellifers. The two following species are thought most likely to be hoverflies. The first one was discovered on Green Alkanet at the southern end of the Waterworks Road. The upturned snout indicates a species of Rhingia although this protuberance (elongated face) would seem more suitable for feeding on the prevalent White Dead-nettle rather than the plant it was on. 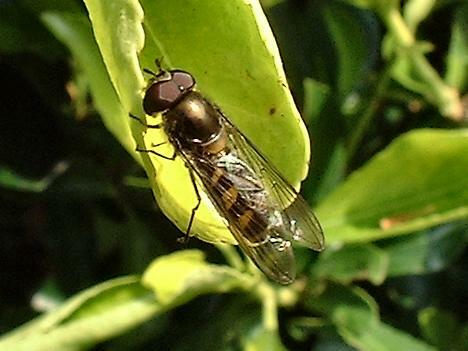 The Rhingia hoverflies have been identified as Rhingia campestris. This is the most frequently encountered of the two Rhingia. The larvae of this species breed in dung. The lateral margins of the tergites (dorsal segments) are edged black in R. campestris, this is clearly visible on the image posted. R. rostrata lacks this feature. Source. The second smaller brown fly (above right photograph) was ubiquitous on wasteland like the Dovecote Bank. The very small Melanostoma scalare hoverflies were seen in the scrubby sheltered areas of north-west Mill Hill. There were more species of hoverflies noticed including a species of Eupeodes (=Metasyrphus) in a Shoreham garden. The outer points of the lunules stop well short of the margin (they reach the margin in Eupeodes corollae). Hoverflies were out on the wasteland on the edge of Shoreham town, especially on the Dovecote Bank: Eristalis pertinax, Erastalis tenax and a species of Syrphus were recognised, but there could have been other species. The very small hoverfly on the left is from the Pixie Path. It is a male Melanostoma scalare; very similar to some Platycheirus, but yellow antennae, front legs not expanded (they are in most male Platycheirus), and note the bright green halteres which this species often has. This hoverfly looked like a bee mimic as well, but it was spotted hovering before it found this inelegant resting place in a Shoreham garden This insect photographed on a Dandelion at the top of The Drive, Shoreham looks familar, but it does not seem to have been photographed before. see something protruding from between the segments at the left hand side? What do you think? Considering that the lethargic bee I found on a dandelion flower [mine was identified by Stuart Roberts as Andrena chrysosceles] was parasitised by 3 x female Stylops, it looks v. similar to your bee. The small hoverfly Meliscaeva auricollis was seen at St. James the Less churchyard, Lancing. On the footpath approach to Mill Hill from the Waterworks Road I was buzzed by a few hoverflies of two species. One of these nectar seeking insects was the Drone Fly (hoverfly) and the other smaller one was still awaiting positive identification at the time of writing. It hovered and behaved like a hoverfly. It is the photograph above left. This is a black colour form of the abundant Episyrphus balteatus. Because the insect was so dark in the photograph above I accentuated the markings in Photoshop (image manipulation program). The first photograph is shown on the right of how it appeared in real life. On the footpath approach to Mill Hill from the Waterworks Road, at least three species of hoverflies including one Helophilus pendulus, a handful of Syrphus hoverflies (with a yellow face and a bright yellow abdomen when viewed from the side) shown in the photograph below, as well as Drone Flies, Eristalis, were attracted to the Ivy. There were two distinctive hoverflies on the ivy with bees, wasps and Drone Flies next (west side) to the footpath approach to Mill Hill from the Waterworks Road: the medium sized Helophilus pendulus which I had not recorded before, and the large colourful Volucella zonaria. The first two are the same species, probably Eristalis, and could be mistaken for bees. The one on the extreme right looks like Syrphus. ID confirmed by Steven Falk (Warwickshire Museum RINGS) on UK Hoverflies. Waterworks Road As the shadow of the camera fell over the leaf, the hoverfly did a miniature circuit, it's that hoverfly on the leaf, and as the shutter lag missed the hoverfly again, it did another circuit and it's the hoverfly on that leaf again. E. pertinax is a common and fairly easily recognised species, though it can be confused with the Drone Fly, E. tenax. The latter has a broader facial stripe between the eyes and little or no yellow on the legs - specifically the tibiae of the hind legs are dark in E. tenax whereas they are distinctly bicoloured in E. pertinax. Whereas the abdomen is tapering in E. pertinax, causing it to resemble a worker Honey Bee, the abdomen is more nearly cylindrical and "chunkier" in E. tenax, so it is more like the drone. This small hoverfly was photographed along the South Downs Coastal Link cyclepath. ID by Paul Beuk on UK Hoverflies. The large hoverfly Volucella zonaria was nectaring on Ivy near the Butterfly Copse next to the Waterworks Road. The Hoverfly, Episyrphus balteatus, is now common with over a hundred in a single Shoreham garden and these numbers are expected to be repeated everywhere locally. The hoverfly landed on a leaf very quickly and then flew off. It is Erastalis tenax (the Drone Fly) remarkably mimicking? a Honey Bee. As the sun struggled to come out, so did the flying insects including at least five species of hoverflies. Five of them were seen in a small patch of garden (amounting to a half a dozen flowers and shrubs) near Buckingham Park, Shoreham. At the time of writing all the hoverflies have not been positively identified, but the following four were definites: the Marmalade Fly, Episyrphus balteatus, Syrphus possibly vitripennis ?, Eupeodes possibly corollae, Volucella bombylans and at least one much smaller species. It appears that for positive identifications to species level some of these hoverflies need to be captured and examined under a powerful microscope. I may have to satisfy myself with just the name of the Genus. The photograph above is of the suspected smaller species which may be too small and the photograph (click on the image to enlarge) not distinct enough for positive identification. The wings in this species are nearly as long as its abdomen which is all black at the tail end. This species is not Meliscaeva auricollis. This identification has been corrected to Platycheirus albimanus by David Iliff on UK Hoverflies. The colourful species of hoverfly known as Helophilus pendulus appeared in my south Lancing garden (TQ 186 044), around the pond, on a thundery day. Also, another pair of hoverflies seem to match other recent sightings of Eupeodes corollae. But according to experts it may be a little hasty to assume the identification to species level is correct. The genus Eupeodes is correct. Hundreds of Hoverflies,Episyrphus balteatus, invade Lancing (TQ 186 045). With their maroon head a wasp-like abdomen it is easy to understand why they are christened the MarmaladeFly. A large nectar-feeding hoverfly settled on the Buddleia bush in a garden in West Way, Lancing, (TQ 198 042) that is near the marshy land between Shoreham Airport and Lancing. The species was not positively identified and this is always tricky as there are at least 250 species of hoverfly found in northern Europe. It was a large species at about 14 mm long. Bill Irwin identified this species as Volucella zonaria. The hoverfly Volucella bombylans var. plumata was discovered near the copse (TQ 211 075) on Mill Hill. This white-tailed hoverfly (pic) is a bumblebee mimic. Hoverflies, Syridae, although they display warning coloration like wasps, are a true fly, with a single pair of wings, and a proboscis like a butterfly for feeding on nectar. A hoverfly, Sphaerophoria scripta, settled on a Prickly Ox-Tongue on the Malthouse Meadows, Sompting. A hoverfly Episyrphus balteatus settled on a Prickly Ox-Tongue on the Malthouse Meadows, Sompting. Hundreds of Hoverflies, Episyrphus balteatus, invade Lancing (TQ 186 045). With their maroon head a wasp-like abdomen it is easy to understand why they are christened the Marmalade Fly. Similar large immigrations have been reported from Dorset, especially from Portland Bill. "A couple of hundred came in through our conservatory. Most of them came in through the patio doors and buzzed against the ceiling, then died due to the heat. I hoovered up the dead four times during the day and one time actually counted 53 bodies on a 3 metre length of window cill." I have noticed a few hundreds around, but they are usually present and there seem to be many more this year.